On one of my recent pilgrimages to the Indian shops on Devon Avenue I picked up what I thought was a four-pound bag of split chickpeas. Imagine my surprise when I got home and saw that I had picked up a big old bag of yellow split peas instead. Quelle suprise! Although to be honest, I am not completely sure that they are yellow split peas. They might be pigeon peas. The bag said chana dal, which I thought was the split chickpeas but when I looked up images online for chana dal I found more images of these than the chickpeas. So I'm not sure what they actually are, or what they are actually called. No matter, though. It wasn't so much that I did not want them; I was mainly disappointed because those four-pound bags are heavy, and now I was going to have to go back again to get the chickpeas. As for the yellow split peas, they are not going to waste. To start with, I made this quick dal for weekday lunches. These seem much sturdier than green split peas, which is why I think they might actually be something else. They do taste like peas. Who knows? All I know is they are all delicious, and all provide a powerhouse combo of protein, fiber, and minerals. How can you lose? 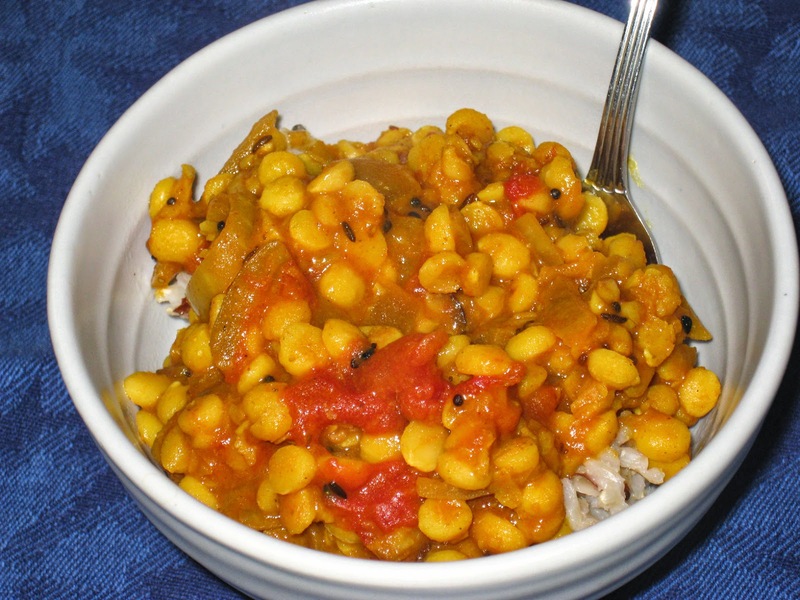 If this recipe seems familiar, it is because by now I have made a lot of dals. The technique is the same. The only differences now are which spices I am currently absorbed with and using at any given time. These days I am adding paprika and amchur to the mix, and I have rediscovered ajwain. But as usual, if you do not have the separate spices and do not want to deal with them, just leave them all out and throw in a tablespoon or three of your favorite curry powder instead. Combine the peas and water in a 3-quart saucepan and bring to a boil over high heat, then lower the heat and simmer until the peas are tender, 30 to 40 minutes. While the peas are cooking, heat the oil and nigella seeds in a medium skillet over medium-high heat. Add the mustard and cumin seeds. When the mustard seeds start popping, add the onions and ginger/garlic paste and saute until the onions are translucent. Add the spices and cook for a couple of minutes, stirring frequently and being careful not to let them burn. Add tomato and cook, stirring occasionally, until the tomato breaks down, 15 to 20 minutes. Add the cooked peas to the skillet, including as much water as necessary to achieve the desired consistency. Season to taste with the salt and pepper. Serve over rice.